Practice Microcontroller questions and answers for interviews, campus placements, online tests, aptitude tests, quizzes and competitive exams. This set of MSP430 Microcontroller Quiz focuses on “Functions and Subroutine”. 1. Which instruction is used to call functions? Explanation: CALL instruction is used for going to a particular address in MSP430. It actually causes the pointer to jump at a particular address and push the current address of the PC to the stack. Explanation: Ret instruction is basically used for returning back from a subroutine. It actually pops the top address from the stack and moves that address to its PC, so that it now returns to the main program and continue the execution normally. Explanation: According to the conventions, R12 to R15 are used for parameter passing and hence are not preserved for the call. Explanation: Temporary results are stored by the registers R4-R11. 5. Can we allocate variables on the stack? Explanation: Yes, we can allocate the variables on the stack, it is a very effective way of storing the variables. 6. Which registers are reserved for passing the parameters to a subroutine and then returning the final result? Explanation: Originally, R12-R15 registers are reserved for passing the parameters to a subroutine and then returning the final result. 7. What actually is the order of stack frame for a parameter to pass to a subroutine? Explanation: All the steps i.e. parameter passed to a subroutine, return address, saved copies of registers(R4-R11), local variables in subroutines are required for passing a parameter to a subroutine. Explanation: When any subroutine is called then the first place of the stack will be filled with the return address, or the address of the PC so that the pointer may return back to its appropriate place after the return instruction of the subroutine. 9. After subroutine which of the instruction is used for returning the pointer back to the main program? Explanation: For returning back from the subroutine, both ret and reti can be used, the main difference between the two is that reti just resets the interrupt flag before the return, so that the interrupt can occur again. 10. Is the approach of making subroutines effective or not? Explanation: The approach of making subroutine is indeed very effective, as with its help we don’t need to retrace/write a particular set of codes again and again. It makes our approach modular. 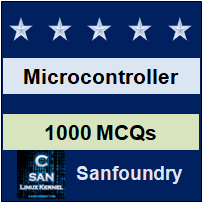 Sanfoundry Global Education & Learning Series – Microcontroller. To practice all areas of Microcontroller for Quizzes, here is complete set of 1000+ Multiple Choice Questions and Answers.